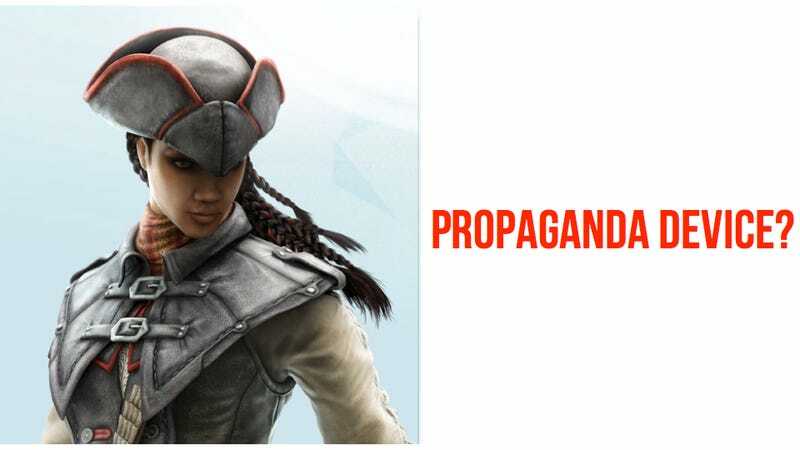 The Bad Guys Are Making Assassin's Creed III: Liberation. I'm Suddenly Much More Interested. Assassin's Creed III: Liberation, the upcoming portable game in Ubisoft's hit franchise, is being overseen by the core AC team at Ubisoft Montreal. But the identity of the team doing the bulk of the work on the game was a surprise to me, when the game's writer told me today. That didn't surprise me as much as the identity of the game's fake developer. First, the real developer: it's Ubisoft Sofia, the Bulgarian team that created the much-loved X-Com/Advance-Wars-style 3DS launch game Ghost Recon: Shadow Wars. They're not known for making open-world action games like the Assassin's Creeds, but my eyes-on impressions today of the game's E3 content sure makes it look like they know how to do this. Assasin&apos;s Creed on Vita Manages To Make Combat Easier, Yet Harder. It&apos;s Complicated. That's cool, but how about this? The fake developer of the game is Abstergo Entertainment. This game, Liberation writer Richard Farrese told me with a rhetorical wink, is the commercialized version of the Animus. It is a product of Abstergo Industries. If you know the series, this is an extraordinary concept. The Animus is the name for the device in this series that lets people relive memories of their ancestors (or, if I'm getting the lore of the multiplayer of recent games right, the Animus will let you role-play a life in another era, like a Star Trek holo-deck). I don't think there have been any hints in the series that Abstergo wanted to sell Animus units to the public. And, if they did, considering that they're the bad guys of the modern-day parts of this series, to what end? Why would Abstergo, a company that essentially is a front for the Assassin-hating Templars, create and sell an Animus/game that lets regular people experience the life of an Assassin? The game is set in late 18th-century New Orleans and the surrounding bayou over the course of a dozen years, as the local French rebel against the Spanish rulers of the former Louisiana colony. (There's also at least one side trip to Mexico.) The game's protagonist Aveline is, theoretically, an assassin hero who helps the resistance while taking aim at Templars. She is not an ancestor of Desmond Miles, Farrese told me, making her the first protagonist in the series without a family connection to Assassin's Creed's modern-day main character. Now I'm wondering if she was even a "real" figure in the game's world or a turncoat. After all, why would Abstergo, a company that essentially is a front for the Assassin-hating Templars, create and sell an Animus/game that lets regular people experience the life of an Assassin? Farrese said that was a good question to ask. We'll have more on the game closer to its October launch. But for now, feel free to wonder: what would Abstergo be up to making a game like this?